Is there anything more food cliché than a round orange coated Gouda cheese wheel in the Netherlands? 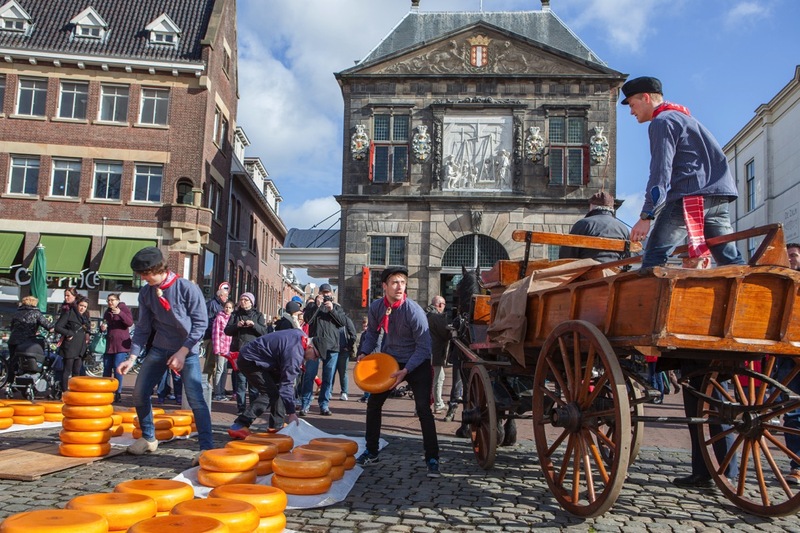 Each spring and summer, in front of the impressive Gouda town hall and the weighing house, the traditional cheese market comes to life. The first mention of Gouda cheese dates back to 1184 and Gouda cheese makes up 60% of the total Dutch cheese production. The cheese is named after the city not because it is produced there, but because it has historically been traded there. In the Middle Ages, Dutch cities could obtain certain feudal rights giving them primacy or a total monopoly on certain goods. Within the County of Holland, Gouda acquired market rights on cheese. All the cheeses would be taken to the market square in Gouda to be tested for quality, weighed, priced, and sold — all with a few hand claps to help aid the sell. While the tradition has now been dressed up to increase the tourist appeal, the market does still play an important role in helping local farmers to get their cheese to market. The Gouda cheese market runs every Thursday morning (10am – 12:30pm) from the beginning of April until the end of August (2016: April 7th until September 1st). The market is not held on Acension Day (May 5th). Heather is a writer, photographer and explorer of the world with bylines in Archaeology Magazine, Porthole Cruise Magazine, Taste & Travel, amongst others. She is addicted to pen, paper, hotels, organisation and hippos. In addition to Travel Gluttons, you can find her over at Cloggie Central.